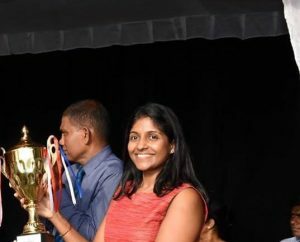 A group of alleged loyalists and close acolytes of the management of Royal Institute International School have commenced a media smear campaign to safeguard their Academic Director Dr. Nirodha Bandara, when she lashed out calling the three bench Supreme Court Judges as heartless, due to an order that was given by them to demolish their Nugegoda Branch School and also the cancelling of its business license. Whilst addressing a group of teachers, parents and students at their Kohuwela, Nugegoda Branch at 92, Sunethra Devi Place last Saturday, Dr. Nirodha Bandara besides calling the Supreme Court Judges heartless not once, but on two occasions (listen to at audio 7 mins 38 seconds), vowed to exhaust all avenues legally and politically (listen audio 3 mins 58 seconds) and also instigated the members of the audience to go and scold the residents who filed a case against the school (listen to audio at 3 mins 34 seconds). Colombo Telegraph in its publication yesterday under the caption “Royal Institute: Kamal Gunaratne Resigns – Owner’s Daughter Says Supreme Court Is Heartless & Vows to Use Political Influence” confirmed that it does have an audio recording of Dr. Nirodha Bandara speaking at the event. 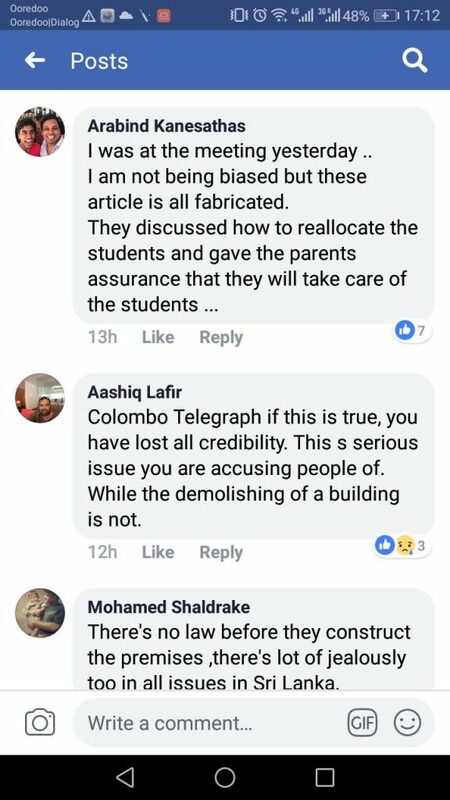 However despite stating that evidence to the facts published in the story is in Colombo Telegraph’s possession in the form of an audio recording (8 mins 17 seconds), it was not uploaded with the published story. 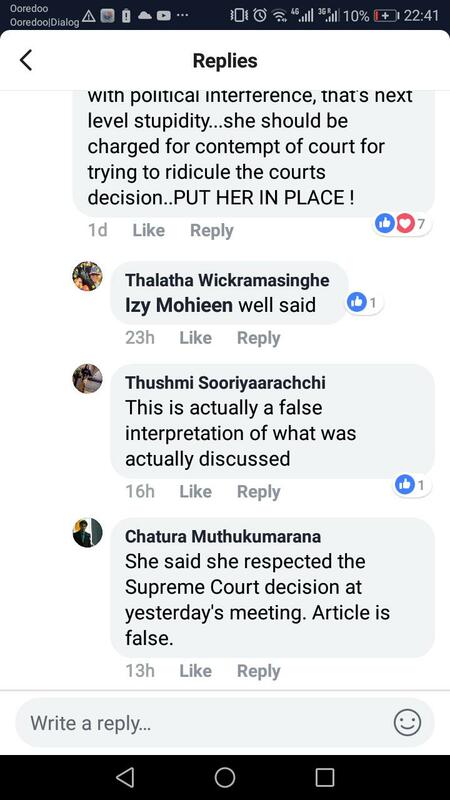 Meanwhile a group of individuals named Chathura Muthukumara, Miuranga Suriyapatabendi, Thushmi Sooriyaarachchi and Sarith Abeygunawardena using their Facebook profiles went on to smear the published Colombo Telegraph story with some saying they were physically present at the meeting and all claiming in unison that Dr. Nirodha Bandara had never made such statements as published. Please see some of the comments posted below. Chatura Muthukumarana: As alumni of Royal Institute who was present at yesterday’s meeting, I can assure you this did NOT happen. She was quite respectful toward the Supreme Court judges and their decision. Chatura Muthukumarana: She said she respected the Supreme Court decision at yesterday’s meeting. Article is false. Sarith Abeygunawardena: This article is inaccurate and fabricated. I was at this meeting and Dr. Nirodha said nothing of this sort. In fact, she affirmed to abide by the Supreme Court’s ruling. However whilst investigating the matter further Colombo Telegraph can confirm that besides Sarith Abeygunawardena the rest which includes Chathura Muthukumarana, Miruanga Suriyapatabendi and Thushmi Sooriyaarachchi have all published that they are past students of Royal Institute on their Facebook profiles. Colombo Telegraph has in its possession all their Facebook profile details to confirm this claim. 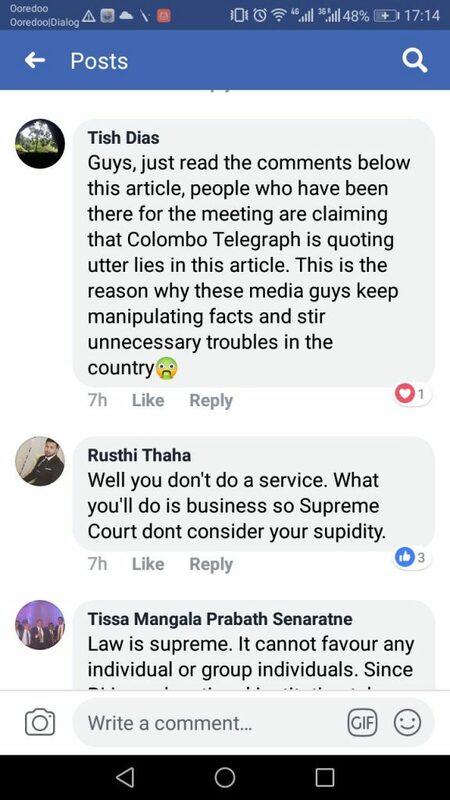 Colombo Telegraph can also confirm that another Facebook profile has been created named “RI Nugegoda – Supreme Court Judgment Discussion Forum” where Chathura Muthukumarana, Dr. Nirodha Bandara, Nevanka Jayatilleke and Duminda Perera are administrators of the page. What now is of most concern is the value systems that may have been inculcated into the so called past pupils by the Senior Management of Royal Institute International School. Earlier Colombo Telegraph in a series of exposes highlighted the injustices that parents and children of Royal Institute were subjected to at the hands of their former Administrative Director and Retired Major General Kamal Gunaratne. ‘Titanic Sri Lanka’ Rocking Again - Take Heed! I’m shutting down for the weekend. I’m sure that there’ll be more articles on this RI imbroglio. I will then put on the results of my survey of the better-known “International Schools” giving priority to two concerns: 1. the extent to which they succeed in balancing the need to produce academic results vs their success in promoting all-round development 2. the fees that they charge. I’ve got more checking to do, but in the final analysis this will be what I, as just an individual, have found out from a cursory look at the scene. Had there been more feedback from other readers, yes, I mean pointing out serious errors on my part, it would have helped. Of the schools that must be taken seriously, Royal Institute is one of the less expensive. However, the emphasis is on studies, and not so much on holistic development. What the school provides depends mainly on what the parents really want; that is often quite different from the claimed desiderata. My ideal would be having medium-sized (or even small) schools within easy access of the home, having some non-competitive sports, and other extra-curricular activity for all students. No mass private tuition, although there may have to be help given to individual students who cannot cope. It’s sad, but there will be increasing numbers of maladjusted children as life becomes “faster”. We seem to do everything faster, but few get anywhere – unless it’s going abroad. There’s a great deal of politics and wastage in running the State Schools – that may seem obvious. It also happens in the “recognised Private Schools ” – which will shock you. Not so much in “International Schools”; storms in tea-cups like this one, and Gateway Negombo where the late Prime Minister Ratnasiri Wickramanayake’s daughter is fussing inordinately over what has happened to her child. The mess in education cannot be sorted out without first putting right all that’s wrong with National Politics. Among those who are most responsible for the mess are those who say that “they are not interested in politics”. Back I am after more than two days in Arugam Bay (first time for me!) I had written the above before leaving, but nothing more has appeared from others since then – although I’d been putting on a few words with my mobile phone on other stories. However two long phone chats with two men too old to post comments here. So, now I have to work out all this stuff that was put into my head. What I heard was told clearly, but what I write is sure to get garbled when I write. Corrections will be appreciated. I will wait for the next articles on this subject.